Meet Elizabeth and Lilly. And God help me, I can’t tell who is who! But I can tell you that their mom is the sweetest lady on the planet. When she contacted me to create her identical twin girls newborn session, she knew exactly what she wanted and I couldn’t wait to make her vision come true. Everything is done in white and creams to keep it all angelic, girly and soft. I just love how baby’s eyelids are the softest shade of lavender making them look so perfect with their rosy lips and fluffy cheeks. Tutus are a must when you are keeping things girly. Don’t you just love the adorable little rolls on her back! All done up in the potato sack pose together. Mom helped me so much with this photograph. She was up under the fur holding her babies to make doubly sure they were safe and sound. Resting in this wooden bowl, this little one is a vision surrounded by sweet roses and daisies. Sleeping side by side, the girls were so perfect and quiet. They kept each other in a dreamy state that made working with them so easy. All tucked in and ready for dreamland, both girls were so content in this tiny newborn bed. The yellow floral headbands were chosen by their grandmother, who just adores the color yellow. And finally, this photograph has a lot of sentimental value for mom. The rosary the girls are holding is mom’s wedding rosary, made by hand by their grandmother. And the jeweled crowns on both of the girls are another item that mom wore during her wedding. I’m sure their mom is going to save these items for them, keeping them safe to wear again on their own wedding days. It was such a treat working with these identical twin girls during their newborn session. The photographs turned out just stunning and I’m looking forward to seeing them again when they are ready to take their first steps! 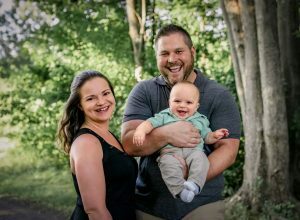 If you would like to get babies photographed and want to customize your session so it is completely unique to you, contact me today. I have 1 newborn opening in October and a few available for November.